I just returned from a great week of traveling to New York. I was attending some wonderful blogging conferences while I was in New York. In addition to the awesome swag that I received, I also gained some awesome information at this conferences. Sadly, I also gained something extra that I was not expecting. I gained some extra weight while I was in New York. The food at these conferences was awesome and I over indulged eating too much food. I also did not exercise for the whole week I was there. That is what led to me gaining an extra 5 pounds. I know what you are thinking, it is only 5 pounds. Those 5 pounds that I gained are making my clothes tight and uncomfortable. I want to be able to lose those pesky 5 pounds. Right now my life is busy and crazy. Since I took a week off work to attend these conferences, I am now playing catch up with work, in addition to taking care of my family. I met many wonderful companies at the conferences that I want to work with so I now have the additional work of networking with them. All this work can be stressful to me and might make loosing those 5 pounds hard. I need help losing weight! When I opened up my packages today I found a box of SlimQuick Pure Extra Strength Drink Mix in a mixed berry flavor. I read the box and discovered that this drink mix has natural ingredients in that will help me to lose weight 3X more than just dieting alone. This 0 calorie drink is not a magic potion, I still have to eat healthy, exercise and watch my calories, but it will help me with loosing the weight. 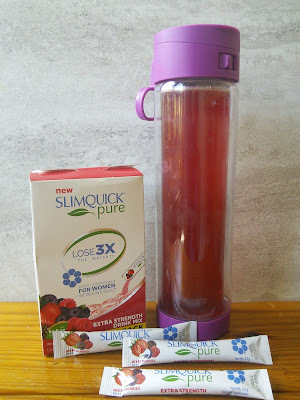 Here is some ways SlimQuick works to help me lose weight. So I had to see how SlimQuick tasted. If a product does not taste good I am not going to use it. The taste was pretty good. It had a nice berry flavor to it and since it was being added to my water, I was able to adjust to my level of sweetness by adding more water. I really liked that this drink was made with natural ingredients like BioPure Green Tea( the fat-burning component), antioxidants, calcium, and vitamin D. There are no drugs in this drink to make me jittery. This drink is 100% good with nothing bad in it. The first day of trying to lose those pounds, I mixed a packet SlimQuick with a bottle of water and drank it with breakfast and lunch. I noticed that day that I did not feel like snacking between meals and I felt like I had more energy when I went out for my morning walk. I also felt less stressed and was able to get some work done. 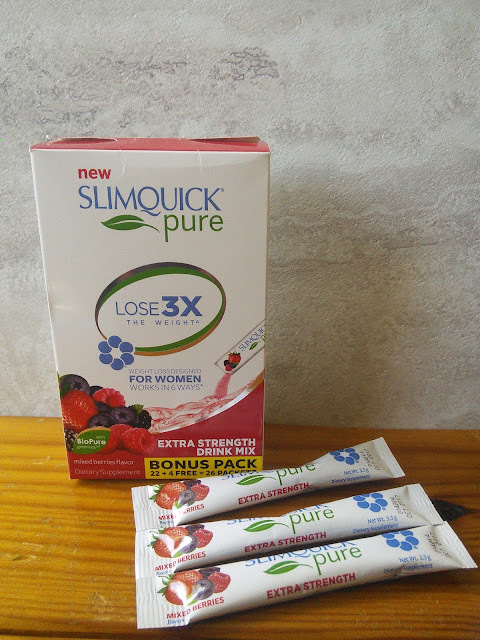 I will continue to use SlimQuick along with eating healthy and going for daily walks until I finish up the box of 26 packets. I will let you know how my weight loss goes, maybe I might lose more than 5 pounds as I want to lose 10 pounds. You can find out more about SlimQuick Pure at the below link. The second link contains a $5.00 off coupon that you can print and take to the store to help you get started with your weight loss. "These opinions are my own and I was sent the above mention product in exchange for a review ." These sound delicious -- and very effective! Would love to see the final results and your thoughts when you're done with this box. This looks great! Doesn't look unappealing at all. Definitely want to try this out soon, thanks for the coupon!! This sounds delicious and easy. Thanks for sharing. That's so cool you were able to go to NY for the conference! I'm sure it was amazing. I would have just kept eating while there, too, lol. I'll have to tell my hubby about this product since he's trying to lose weight. This sounds like a really good product to try. I personally haven't heard of this brand before. Thanks for sharing your honest review of this product.